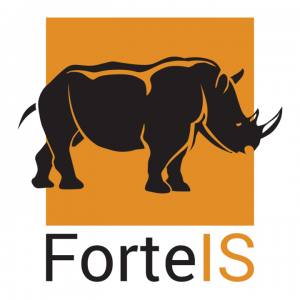 Rhino was developed by Forte Information Solutions with input from real sales people, so essentially it was designed by sales people for sales people. The result is a CRM that’s simple and logical to use. 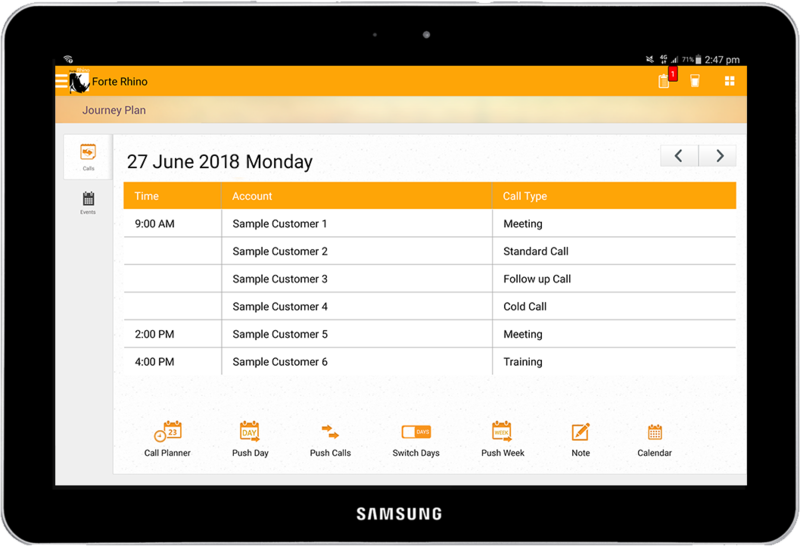 Sales teams actually enjoy using Rhino in the field to plan and manage their customers and appointments; and management, in turn, enjoy the visibility and insights gained as a result. Rhino automates the sales process from prospecting through to ongoing account management. It eliminates the need for cumbersome manual and paper based processes which are time consuming and prone to loss of data. 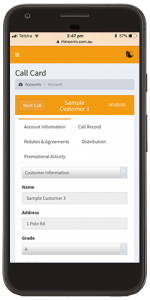 Rhino gives sales teams a single repository for customer information, viewable by each customer account. Rhino is a cloud-based solution with secure data hosting and local ongoing technical support. Rhino is a modular system which we can tailor to your business’ unique requirements. At Forte, we partner with each of our customers to implement a solution and deliver training in line with your business’ protocols for maximum uptake, acceptance and usability. The online version of Rhino will work on any device with an internet connection including mobile phones, tablets, laptops and desktops, regardless of the operating system (eg. iOS, Windows, Android). The online version can also be linked to the Android application allowing the sales team the option of using the local application on their tablet and the online version on their mobile phone and desktop, for example. Internal teams such as telesales and customer service can also use the online version in the office to record their call notes against customers, which can also be viewed by the sales team in the field. The Android version of Rhino requires a tablet device with Android Operating System. 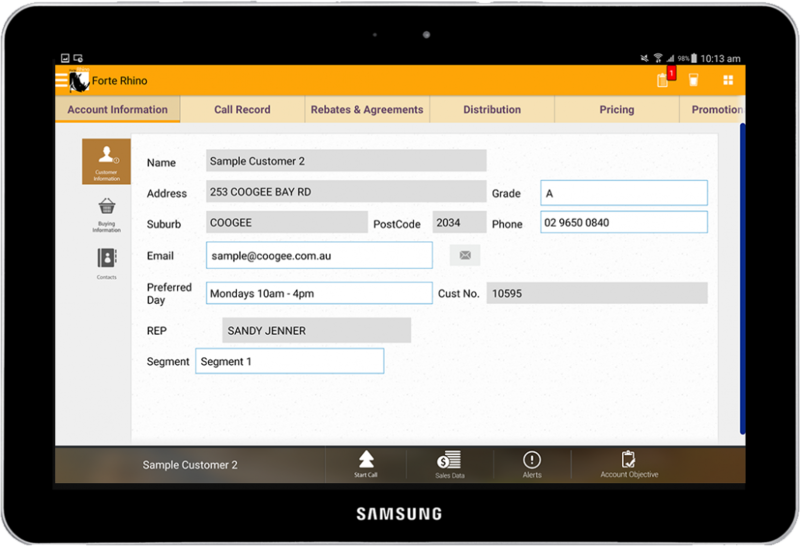 The Android based application is stored locally on the tablet, allowing the user to work on or offline. An internet connection is not required to use it, however we recommend a device that is 4G and wifi enabled. A background synchronisation process occurs automatically every 15-20 mins depending on the connection available. We recommend a Qualcomm processor (Quad 1.8GHz + Quad 1.4GHz) Octa-Core with 64GB internal memory storage. A large screen size is preferred (close to 10 inch where possible). Rhino has the ability to integrate with your existing systems that you have in place. We can import your data using a scheduled process and/or achieve real time integration via our RESTful API. We provide clear documentation on how to access and utilise the API, but if you do need additional help we are more than happy to work together with your technical personnel to ensure a seamless integration process. We utilise AWS Cloud services to host our clients’ databases and run our webservers, providing a secure and efficient CRM platform. Whether you opt for the Android application or the online version of Rhino (or both!) all of the information captured by the sales team can be viewed on the Website. The Website has separate areas for viewing reports and maintaining data. User access privileges can be managed by you and all information can be exported into either .csv or .pdf formats. You also have the flexibility to create your own reports using the various tables available in Rhino. Rhino is a cost-effective solution for SME and larger businesses alike. Pricing is largely dependent on the data integration requirements and your existing data source. We can work with you to streamline the integration process as much as possible. Our pricing structure typically consists of a one off setup fee (determined by the complexity of the data requirements), training (day and hourly rates available), and a monthly user licence fee which includes access to local technical support. Packages can be tailored to meet your business requirements and budget. Contact us today to find out how we can help you.